In the fifth novel in the John Madden mystery series, Inspector Madden is called upon to assist Scotland Yard on a notorious decade-old murder case. On a hot summer day in 1938, a beautiful actress is murdered on the grand Kent estate of Sir Jack Jessup, close friend of the Prince of Wales. An instant headline in the papers, the confession of a local troublemaker swiftly brings the case to a close, but in 1949, the reappearance of a jade necklace raises questions about the murder. Was the man convicted and executed the decade before truly guilty, or had he wrongly been sent to the gallows? Inspector Madden is summoned out of retirement at the request of former Chief Inspector Angus Sinclair to re-open the case at Scotland Yard. 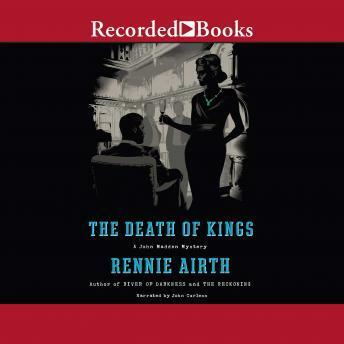 Set in the aftermath of World War II, The Death of Kings is an atmospheric and captivating police procedural, and is a story of honor and justice that takes Madden through the idyllic English countryside, post-war streets of London, and into the criminal underworld of the Chinese Triads.